The fourth life priority in the HRVWE model is Work. We all seek to do good work, to advance ourselves and the world. We need a good set of practices for that work. The practices we emphasize in this Guide are all present in the Do loop. Beginners may find it easiest to first memorize the loop as Four Steps (Learn, See, Do, Review), but professionals should move up the Eight Skills, as splitting Seeing and Doing into the eight separate skills, as we do in Chapter 5 (The Do Loop), offers the most balanced, complex and powerful approach to your work life. The Eight Skills form the acronym LAISEIRR. To remember them, think of your using them to “focus like a laser” on your personal success in the workplace, and with your teams. When we apply the Eight Skills to ourselves, recall our discussion in Chapter 1 that good foresight “starts with certainty,” with learning our past and present (foresight preparation), and then discovering those things likely to still be around in our future. Because our traits are certain to change only slowly over our lives, they predict a good deal about how we are likely to interact with others. To make best use of them we should therefore try to “design our lives around them” in several important ways. In the language of the Eight Skills, personal foresight begins with self-learning, moves to self-anticipation, then to creating great options for ourselves (alternative personal futures), then to generating better priorities and strategy, then on to execution and the remaining three skills, so we can start into our loop again. With respect to self-anticipation, we all need to admit that we have a unique and relatively future-stable (predictable) set of psychological traits. Some of our traits are common to all humans of our age and type, as developmental psychology describes. Other traits are unique to us, given our own particular nature and nurture. Our personality traits can be changed to some degree if desired, but only slowly. Most traits we are comfortable with and typically like, or have made excuses for, and those we don’t want to change. Later in this chapter we’ll explore some good starter models for our traits, and some implications of various traits for foresight practice and self-leadership. Other terms for traits are cognitive styles, personality types, and workplace strengths. Strengths is the term Gallup uses in StrengthsFinder 2.0 (2007), a self-assessment tool we’ll cover in Section II. Traits is the term we’ll use most often, as it comes from the psychological literature, and it helps us remember that a strength in one context can be a liability in another. We also learn many specialized skills in during our careers. The Eight Skills and Twenty Specialties of foresight in this Guide are skills. Other terms for skills include abilities, knowledge, and practical techniques. Unlike traits, our skills are much more easily learned, and are just as easily consciously forgotten, if not regularly practiced (but the good news is that a skill, once learned, can be relearned much faster later, if one desires). Studies show that some consciously forgotten skills can be relearned to the original proficiency in as little as half the initial learning time, often even many years later, as when an adult takes up piano again at in their fifties, after childhood lessons. This is good to remember if you ever want to get your science, math, language, music, or other skills back to a place they once were, and then go beyond. 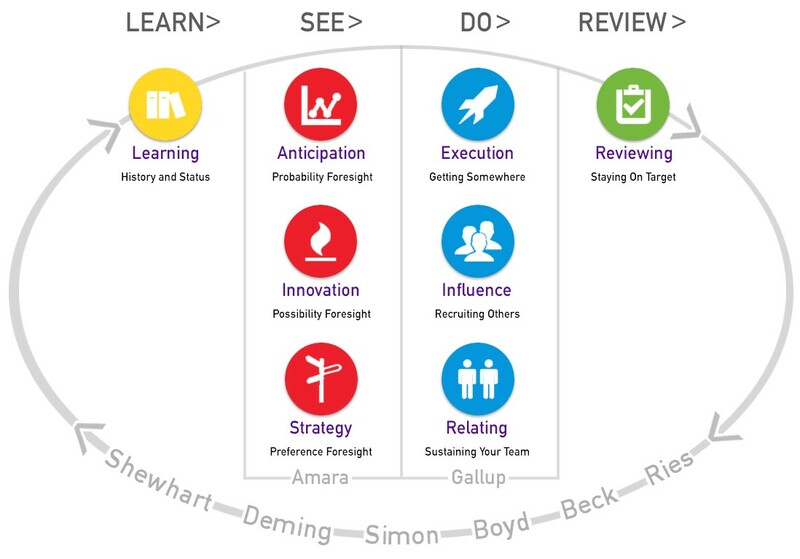 Educational foresighter Charles Fadel, head of the Center for Curriculum Redesign, offers a four-factor (aka “competency” or “dimension”) model of the kind of learning we all need to adapt in a world of VUCA (volatility, uncertainty, complexity, and ambiguity) and accelerating change. The four competencies are shown in picture right. Knowledge (domain competency, and occasionally, interdisciplinarity) is the traditional focus of 20th century education. 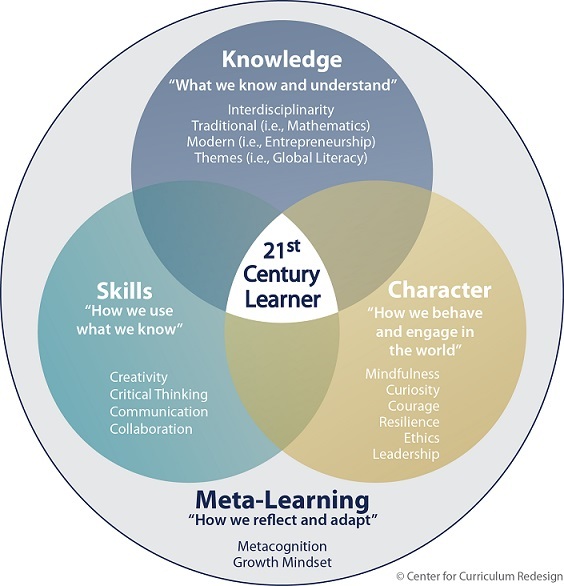 In this century, competency must be combined with self-understanding and improvement of Character (largely, our personal traits) and key Life Skills (starting with creative, critical thinking, communication and collaboration (4Cs) skills. Fadel proposes these three competencies combine to form Metacognition, our general emoting, thinking, learning, and adaptation ability. He identifies the growth mindset, to be discussed shortly, as one key feature of good metacognition. For more see Fadel and Trilling’s Four-Dimensional Education, 2015. The Eight Skills, in this framework are a key set of adaptive skills we can learn on top of the 4Cs and other key life skills. All of this together determines our adaptability to the future. Just as addictions can be retired, traits can be changed. The process just takes a lot of work, so you should be very selective in what you attempt to change. For character traits that may be damaging you professionally, like procrastination, exaggeration, dishonesty, indecisiveness, arrogance, aloofness, laziness, greed, or others, trait-change work is often an excellent idea. You may not move the needle much, but even small changes in really negative traits can have big effects over your career. Transformational change can occur in individuals just as in organizations, if the desire is there. You may never become great at traits or strengths you presently lack, but you can become minimally proficient in any trait by intense, deliberate practice, and by finding others who are great at modeling that trait, to mentor and monitor you and help you improve. We must also be aware of declining returns in our trait change work. As the late management scholar and foresight leader Peter Drucker advises in his classic “Managing Oneself”, in Clayton Christensen, ed., On Managing Yourself (2011), it can quickly become a waste of your precious time and effort trying to further improve your weaknesses. It is usually a better strategy, especially early in our careers, to work with our strengths to build mastery, and compensate for and work around our weaknesses, rather than trying to directly improve those weaknesses, unless they are particularly damaging to us. Improving a personal weakness from “atrocious” to “well below average” is usually a very smart strategy for career-important strengths (empathy, salesmanship, execution, organization). But once you’ve reached “well below average” for many strengths, further progress may be increasingly difficult, and further time and energy expenditures may be increasingly hard to justify. At some point you will better served figuring out how to delegate tasks requiring that strength to others, rather than doing them yourself. Tim Ferriss is one self-experimenter who takes this delegation perspective to its extreme, seeking to offload to others anything he cannot do best and most uniquely in the world. See his The 4-Hour Workweek, 2009, and his insightful podcast series for more thoughts on best practices for delegation and expert performance. Thinking strategically, we should seek to use our strongest traits and strengths well in producing high value work. Many people end up, due to chance and circumstance, in jobs or doing tasks that don’t regularly use their strongest traits and strengths. If that’s where you find yourself, get out of that position as soon as you can, and find or make one that better fits with your natural abilities. Such a career move takes both foresight and emotional courage, a topic we will discuss shortly. Another aspect of self-management is self-control, a challenge that involves doing (execution, influence, relating) the most strategic things, and reviewing to be sure they are done, and have had the desired effect. Doing the right things well requires shepherding our finite personal resources including our emotion, cognition, attention, and energy. Crudely, we call such resources “time”, but it isn’t time we truly need to learn to manage, it is these precious, biology-based personal resources. Personal foresight is work worth working hard at, and what you become by it will be your greatest treasure and legacy to your partner, your family, and the world. The only thing stopping us from gaining the great benefits from such work is ourselves.